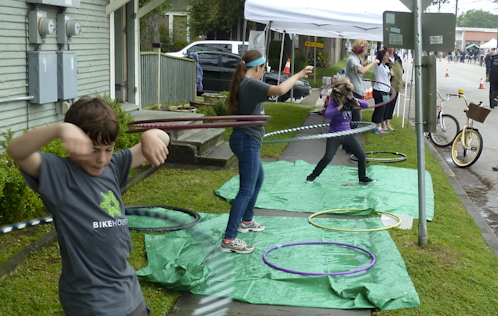 This spring, the City of Houston launched a new initiative called Sunday Streets HTX - a street closures program piloted over three events. A steady force behind the project was Rice Design Alliance staff member Raj Mankad, investing lots of personal sweat equity and community organizing and hitching it to the RDA's terrific knack for making the news. The following Q&A sheds light on Raj's behind-the-scenes efforts to help the community match the power of City Hall to produce an event that met everyone's interests. We often say that AAO Members are vital connectors when it comes to advocating for better design and quality of life in their respective communities. Consider Sunday Streets HTX further evidence to support the claim. 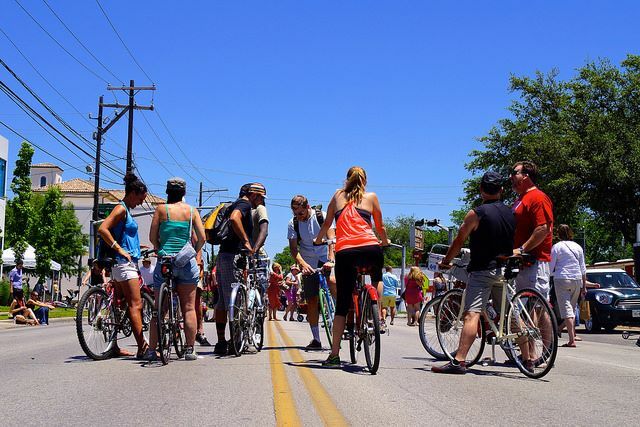 AAO: What was the inspiration for Sunday Streets HTX? Raj Mankad (RM): When I joined the Rice Design Alliance (RDA) as editor of its Cite magazine in 2008, I spent a lot of time reading through the archives that go back to 1982. I was struck by just how long the lament had been over Houston's lack of public life. The same complaints coming up year after year. Even today, Philip Lopate's 1984 essay, "Pursuing the Unicorn: Public Space in Houston," in the eighth issue of Cite, has a bit of a cult following. Then, about two years ago, I edited another little wave of articles on this theme. Stephen Klineberg, a sociologist at Rice University, releases the Kinder Houston Area Survey every year and in an article for Cite he showed in depth how a majority of Houstonians now express a desire to live in neighborhoods where they can walk to do simple things like buy groceries. Another writer, David Theis, contributed a piece about how Westheimer Road is home to world-class restaurants and bars but its public realm is in disarray and dangerous to navigate by foot. Finally, John Pluecker wrote a lovely blog post for OffCite.org about a Sunday Street in Ciudad Victoria, Mexico. If a city in the middle of a drug war can pull this off, he asked, why not a prosperous city like Houston, too? Pluecker's article struck a chord with me, partly because we had known each other for ten years. I had worked with him on rallies and marches for peace and economic justice back when I was a student activist. That experience, trying to exercise free speech, opened my eyes to the importance of a vibrant public realm. With each article I read or edited for Cite, my perspective broadened. Ultimately, in February 2013, I drew language and ideas from these articles, and crafted them into a petition calling for a regular pedestrian and bicycling promenade. The petition really took off through social media, blogs, and local radio. After just one week, the Houston Chronicle editorial board had endorsed the petition. AAO: What did RDA do to get behind this pilot? RM: Rice Design Alliance creates platforms for civic-minded people to educate one another, debate ideas, and, ultimately, effect change. We produce civic forums, lecture series, charrettes, design competitions, and publications. The organization itself generally does not adopt official positions, but we frequently create platforms for individuals to share bold ideas. And, if you look back at our 42-year history, there's been an ongoing effort to enhance the public realm. If the hope is to reach new people, you need a vibrant public sphere. [Our organization] is trying hard to expand its audience, expand the range and depth of what is discussed. You end up having to step back from a specific agenda, and, instead, try to create the agora." Our first civic forums in the early 1970s were about treating the city’s bayous not just as a big drainage system but as parks and wildlife refuges. At the time, it was a controversial idea and even drew the ire of an angry Ku Klux Klan member. The effort around our bayous continued to unfold over many years. Our 1986 design competition for Sesquicentennial Park, which was built on the banks of Buffalo Bayou, helped turn public perception. Other non-profits have since formed to build trail networks and enhance the parks. Today, recreating on the bayous is taken for granted, but the role of the Rice Design Alliance was central to the shift, even if that fact isn't much known outside our core membership. The Sunday Streets HTX effort more or less follows that trajectory. Cite and OffCite.org were platforms for the idea to develop. As an individual, I made the petition, which helped generate public support and create momentum. In fact, there were already people at the city government working on the idea, with the petition then connecting them to citizens who would help. I was able to collaborate across groups because, after working at RDA for five years, I had formed relationships with other writers and editors, non-profit heads, leaders in city government, and business owners. So, even though RDA and Cite are relatively small entities with rather broad missions, and even though our organization doesn't adopt official positions, sometimes we can have an outsize impact by way of the networks and audiences we have nurtured over decades. AAO: The variety show format seems to be making a comeback of sorts (witness last month’s Spotlight on RIBA’s Late Tuesdays in London)… and so here comes along Sunday Streets HTX and it just seems to naturally exude a sense of fun and possibility. Was that a conscious decision in organizing these events, a reflection of Houstonians' spirit, or something else entirely? RM: I love this question and I think the answer is complicated. When I was an activist in the early 2000s in Houston, I remember our chants bouncing off the empty downtown high-rises on weekend afternoons. Our message was right and righteous, but we were disheartened by the isolation. You know, there is a time to rehearse arguments with people who already agree with you. Preaching to the choir can help the choir sing better. If the hope is to reach new people, though, you need a vibrant public sphere. Zygmunt Bauman has written extensively on this need in books like In Search of Politics. The same points can be made about the efforts of architecture and design organizations. We’re trying hard to expand the conversation, expand the audience, expand the range and depth of what is discussed. You end up having to step back from a specific agenda, and, instead, try to create the agora. Having fun, it turns out, is radical. It can be the best way to create that public sphere. Sunday Streets HTX is part of an international movement going by many different names. In the United States and Canada, the umbrella term is "Open Streets" and the Open Streets Project has facilitated efforts across the continent by publishing a free guide and holding conferences. The first thing I learned was that I should look for allies in our city’s health department and health non-profits. My interest in Sunday Streets stemmed more from urbanism, architecture, and public life, not health. At least, not initially. The Open Streets concept, however, is wonderfully encompassing of different agendas. Conservatives, liberals, radicals, environmentalists, health advocates, urbanists, Christians, business owners often love the idea. 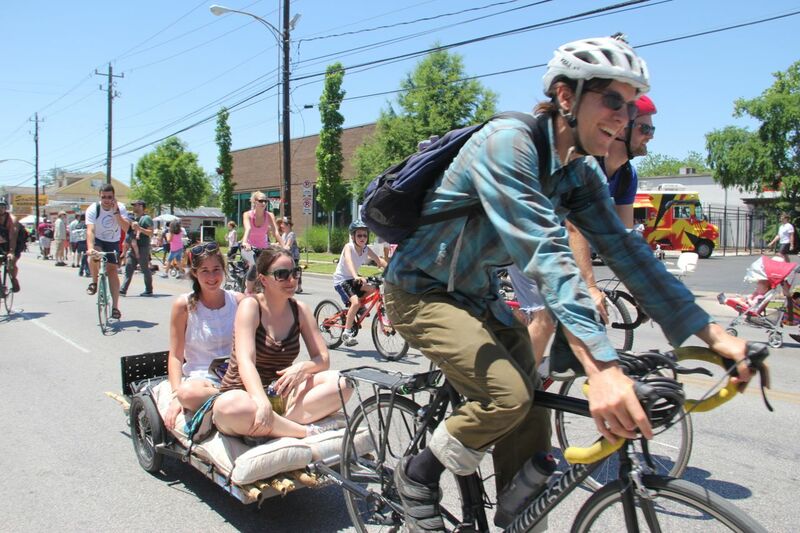 But, as I helped publicize the Sunday Streets pilot program to all these people — more than 20,000 people walked and cycled along Westheimer on May 4 — I did weave in architectural history and an analysis of the politics of space. Lars Lerup, who is on faculty at the Rice School of Architecture, argues that Houston is a city of "stim" and "dross." Unlike European cities that are a series of promenades or sequences of spaces shaped by buildings, Houston is mostly defined by all the in-between space, the "dross." Houston often feels empty. Everyone is in their air-conditioned boxes until some temporary stimulation or "stim." So, yes, perhaps Houston is especially about festivals because we have to compensate for our built environment. And maybe Sunday Streets HTX is another festival, a release valve for people's desire for life in the streets. 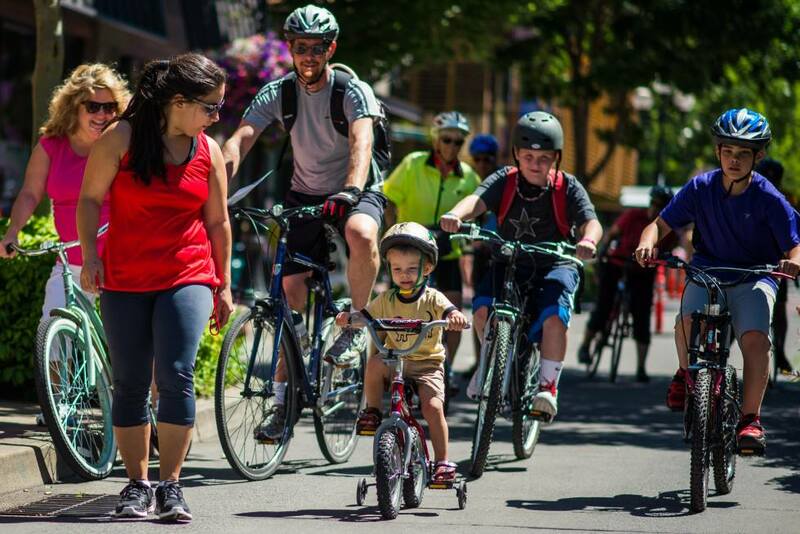 However, I prefer to think of Sunday Streets and the whole Open Streets movement as a step towards a more fundamental change in how we relate to one another and our built environment. AAO: With most citywide events, there can be lots of twists and turns during planning — from initial idea to final implementation. Can you briefly recount how you got the event up and over? RM: At first, I was simply collecting signatures, not just electronically, but in person with my eight-year-old daughter. We walked up to strangers at fairs, farmers markets, and a film showing. When it became evident, after just a month, how interested City Hall was, my time shifted to attending meetings. Lots of meetings. I felt frustrated at times, like we were spinning our wheels. In retrospect, every meeting, even the ones that seemed like a waste of time, helped us get to our goal. I'm astonished by how quickly the City moved in the end and how fast the community mobilized. AAO: Sounds like the City really stepped up. So who were the main partners in this project? RM: The City of Houston is the main actor under the leadership of Mayor Annise Parker. Laura Spanjian, who directs the Office of Sustainability, and Carra Moroni, who is a Senior Health Planner, played lead roles. The Mayor's Office for Special Events, led by Susan Christian, oversees all the logistics of actually closing a street to cars and opening it to pedestrians. The activation of the street comes from individuals and from a huge alphabet-soup of local groups that changes somewhat depending on the site of each individual Sunday Street event. 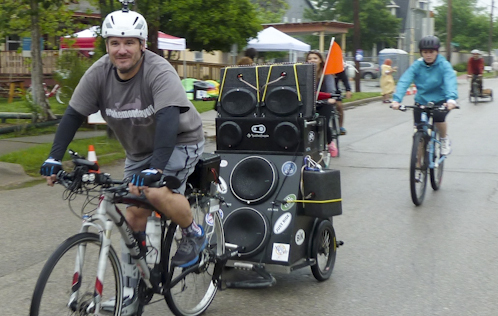 I tried to be helpful in making connections across the groups, and inviting all my old friends, the freaks, the artists, the musicians, the guy who pulls a thumping sound system from his bike. AAO: Much of the advance publicity for Sunday Street HTX stemmed from the OffCite.org blog. Can you speak a bit about that effort? RM: For each of its first five years, OffCite.org has averaged around 50,000 unique visitors. 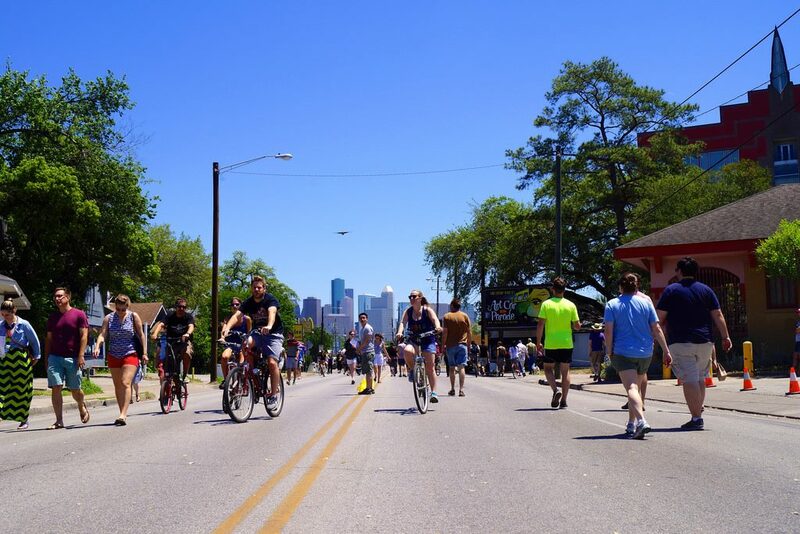 This year, we are on track to double that number for a variety of reasons, one of them being the success of Sunday Streets HTX. I avoid walking [on Westheimer Road] because of the heavy traffic, and the few times that I drive there, I don't see much because I'm watching out for the heavy traffic. 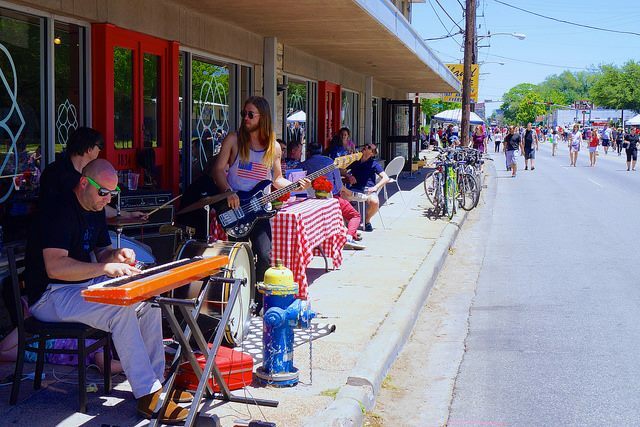 [During Sunday Streets] I saw Westheimer up close for the first time." There is an opportunity for AAO members hidden in all the bad news about architecture and design media. As full-time design writers disappear from newspaper staffs, the editors and remaining writers are increasingly reliant on non-profits to package content. Reporters and editors follow the RDA Twitter and Facebook feeds. We send out press releases. We develop personal relationships. Sometimes we go out of our way to help reporters with stories that never mention us. A previous editor of Cite now works for the Houston Chronicle. I do think architecture organizations should invest in marketing, but we can also produce media. In this era of the internet and social media, paying writers and editors can be more cost effective than buying ad space or sending out run-of-the-mill press releases. AAO: What do you suspect will be the future of this event, and have you accomplished what you wanted to do? RM: So far, North America has not produced any Open Streets or Sunday Streets on par with the weekly events in many Latin American cities. Maybe Houston can pull it off some day. The Ciclovía in Bogotá took decades to develop into an event with approximately two million people participating every Sunday over 120 kilometers of car-free streets. In the near term, Houston is likely to pursue a public-private partnership model to keep Sunday Streets HTX going. AAO: Any parting words or experiences that stick with you as you look back on these first three pilot events? RM: I remember one conversation with a participant during the second Sunday Street events who said, "I saw Westheimer up close for the first time. I avoid walking there because of the heavy traffic, and the few times that I drive there, I don’t see much because I’m watching out for … the heavy traffic." That was gratifying to hear. Westheimer Road has some great buildings with moderne detailing, adapted bungalows, street art… you get a sense of a layered history, which Houston isn't exactly known for. I also met a college-aged woman who told me to visit OffCite.org to get information about Sunday Streets. These are people outside RDA’s normal audience. And, at the first Sunday Street, along Quitman, an African-American church put their choir outside on the steps. It was glorious. Maybe we are turning a corner.